The history of cloth fabric dolls goes back as far as mankind has been making textiles and extends to the present day. The earliest existing cloth dolls were found preserved in wealthy patrons of ancient Egyptian tombs. During the 1880s painted faces or printed lithographed fabric Rag dolls, Folk Art primitive dolls were popular in the New England states of the US.A. Cloth dolls with printed photographic faces first appeared in 1906. 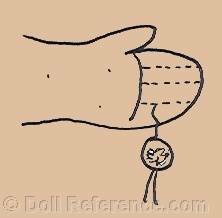 To identify a cloth doll, it may have a label sewn into a body seam or the clothing, originally it had a hangtag with the company name and the dolls name, which is probably now missing, some have an ink stamp on the bottom of a foot, to help identify the doll. If all these are missing and the doll is now unmarked, a bit of research will be needed to rediscover it's identify. 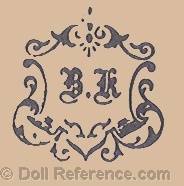 Below are the cloth doll makers, doll labels, doll markings, doll names, trade names, etc. we have found. Alkid Doll Company 1919-1921 USA, made all kid leather dolls, socket head with a shoulder plate dolly face, had glass eyes, closed mouth, mohair wig, doll mark symbol a standing mountain goat, with ALKID DOLL TRADEMARK Pat'd applied for. B. Altman & Co dolls 1920s-1930s USA, a New York city department store sold imported cloth dolls labeled; Made in (Name of Country) for B. Altman & Company. Some of these cloth dolls resembled Alma dolls, they also imported unmarked Norah Wellings dolls from England. American Needlecraft, Inc. 1930s NYC USA, made well known radio and television cloth character dolls by exclusive license of Famous Artist Syndicate; Orphan Annie, her dog Sandy, Smitty and Herby, probably marked or labeled Famous Artist Syndicate, American Needlecraft plus the dolls name. APW Paper Company 1924 Albany, NY USA, made 12" black rag dolls on printed cloth that was cut out, sewn and stuffed. It is unknown if the cloth was imprinted with the makers mark. Stella Adler, Adler Favor & Novelty Company 1919-1930 USA, boudoir type dolls with long limbs, floppy cloth character dolls with mask faces, some with a voice or squeal box; Boo doll, Sal doll, Rube doll, Doodle Dear doll with a spit curl on forehead, and infant, Baby Love doll, doll mark is unknown, but probably had a hangtag with company & dolls name. Alliance Toy Company 1917-1920 ENG, made all cloth character dolls; Golliwogg dolls, it is unknown if dolls are marked. American Art Dolls Company 1916-1917 USA, connected to Strobel & Wilken, made cloth character dolls of stockinette or canvas similar to Käthe Kruse dolls, it is unknown if/how dolls are marked. American Stuffed Novelty Company 1923-1930s+ NYC, USA - cloth Art and Boudoir dolls with long limbs in sateen fabric, painted pressed cloth face; Aunt Jemima doll. Like Like Line of dolls; Co-Ed Flapper doll, Colligiate Flapper, Follies Girl, Parisienne Belle, Silk Flapper, Pierrot doll, Pierrette doll, Trilby doll, Yama doll, composition Mama and Baby dolls, doll mark Life Like Line, clothing designed by Morris Politzer, distributed thru Edwin A. Besser, George Borgfeldt & Louis Wolf. Anita Novelty Company 1929+ USA, in 1929 joined the European Doll Manufacturing Company, made French head Flapper boudoir dolls, pillow dolls and novelties. Annin & Company 1925-1926 USA, made printed lithograph cloth dolls from a two piece pattern that was stitched together by the home sewer. S. Arno & Son Company 1917-1918 ENG, made cloth dolls, it is unknown if/how marked, probably came with a hangtag with company & doll name. 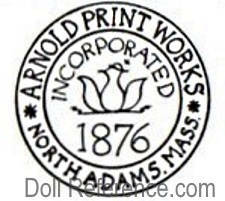 Arnold Print Works Incorporated 1876-1925+ North Adams, Mass. USA, colorful printed lithograph cloth dolls patterns to be cut, stuffed and sewn by the home sewer, ca. 1893 Our Soldier Boys cloth printed doll designed by Celia M. Smith, 1892 Palmer Cox Brownies. Art Fabric Mills Company 1900-1910 USA, (then successors Selchow & Richter 1911-1930) Edgar Newell (company President) created a cutout printed cloth infant doll named Life-Size Doll, 8-30" tall, colorful lithograph facial features, hair, black high boots, undergarment and printed on bottom of foot: Art Fabric Mills New York Pat. Feb. 13, 1900. Some Art Fabric Mills cloth doll names are: Baby doll, Billy doll, Bridget doll, Buster Brown doll 16", Cry Baby Pin Cushion doll, Diana doll, Dolly Dimple, Foxy Grandpa doll, Merrie Marie doll, 1907 The Newlyweds Kid (baby Snookums) cloth doll (The Newlyweds comic strip characters by George McManus), Topsy dolls and Uncle doll. Art Toy Manufacturing Company 1919-1923 ENG and distributed in NYC, made dolls of cloth 9 - 30" tall or plush covered kapok filled cloth bodies in white, pink or blue with stamped trimming and velvet faces. Two styles; style No. A. had long hair plaits and style No. 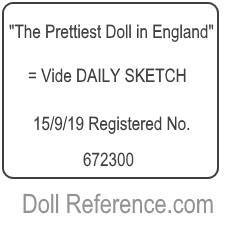 B had a fur muff, doll mark Misska, doll label "The Prettiest Doll in England = Vide DAILY SKETCH 15/9/19 Registered No. 67300. 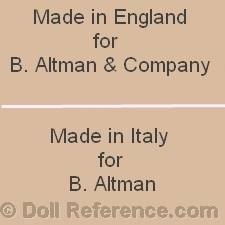 Atlas Manufacturing Company 1914-1918 ENG, made cloth dolls, also some dolls with British ceramic heads and hands. Aunt Jemima Mills Company 1908-1910 USA, printed lithograph fabric black Aunt Jemima dolls and other related cloth rag dolls. Aux Trois Quarters Company 1905-1924s FRA, famous Paris, France department store that sold special order dolls that bear their name, made of bisque or cloth from various doll makers. Baby Barry Toy trade name of Universal Toy Company 1950s NYC, NY USA, made hard plastic, cloth and vinyl dolls; various sizes of Emmet Kelly doll, as Willie the Clown, dolls maybe marked EMMETT KELLY WILLIE THE CLOWN with cloth tag sewn into seam Exclusive License Baby Barry Toy. N.Y.C. Captain Kangaroo doll, cloth and vinyl dolls may have a mark on head B.B. or 1961 ROBT. KEESHAN ASSOC. INC, have a tag sewn into seam Exclusive License Baby Barry Toy. N.Y.C., see also the 1950s Hard Plastic doll page. Bach Brothers Company 1908-1909 USA, black or white flat faced with painted hair and facial features cloth dolls marked & named Bye Bye Kids Strictly Sanitary Old Mammy. 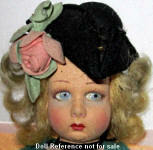 G. Bagnaro Company 1928-1929 FRA, handmade cloth mask face shoulder head dolls registered name La Pompadour dolls. L. Bamberger & Company 1892-1930s USA in 1930 made a line of cloth dolls marked IKWA, used the slogan; Under the China-Berry Tree. Bell & Francis Company 1906-1921 ENG, cloth character dolls including Allied Forces dolls, and British ceramic and composition dolls. Rolf Berlich Company 1920-1924 GER, cloth dolls with side glancing glass eyes, jointed bodies, mohair wig, doll mark a lead seal attached to dolls cloth mitt and symbol. Gregoire Biberian Company 1929-1931 FRA, cloth art dolls, doll mark intertwined DBG. 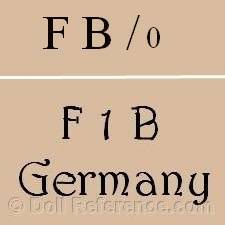 Fritz Bierschenk Company 1800-1930 GER, cloth mask face dolls and bisque head baby and child dolls, doll mark FB, F & B Germany. Binder & Cie Company 1918+ FRA, made cloth dolls, doll mark BK on a shield. Babel Bland-Hawkes Company 1918-1930 ENG, small cloth and mascot dolls called Cuddley doll, also Baby Royal doll and Caprice a multi-face, three faced doll. Bonin, Lefort & Cie Company 1923-1928 FRA, made cloth costumed dolls, doll mark a symbol of a boy and girl playing in a circle. Bonser Doll Company, then Bonser Products 1925-1930+ Mineola, NY USA, also distributed thru Wyse-Bailey, founded by Helen Haldane Wyse, made washable cloth stockinette dolls; Betty Bonser doll, Bobby Bonser doll, Buddy Bonser doll, added in 1930 composition Rattle head dolls with a cloth body sizes 7-30" tall, also a long limbed character doll. Bonser dolls were marked with a circular paper hang tag with a checkered border; I am a Bonser Doll. 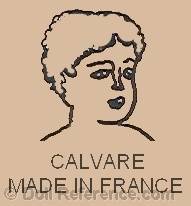 Calvare Company 1920s FRA, made cloth art dolls with molded pressed face large heads, fine raffia like hair, large stationary side glancing eyes, closed mouth, pink cloth body over a wired frame, flesh colored arms, stockinette legs with tiny feet, clothing and doll mark Calvare Made in France. Adrien Carvaillo 1915-1939 (Paris, France), La Vénus dolls are 14 1/2 to 23 1/2 inches tall, made of felt cloth with painted faces, doll mark Venus, distributed by Bon Marché, quite similar to Lenci cloth dolls. Cocheco Manufacturing Company, then Lawrence & Company 1827-1893+ Boston, MA USA, made cloth rag dolls beginning in 1889 designed by Celia & Charity Smith, rag doll mark; Cocheco Manufacturing Company 1827, Boston - New York - Phlia (in a circle), Lawrence & Co, Patented Aug. 15th 1893 Number 503316. 1893 Ida Gutsell designed the cloth rag dolls. 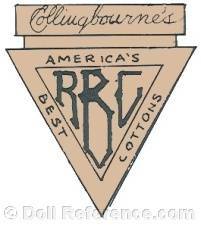 Collingbourne Mills Company 1920s USA, made cut out and sew at home cloth rag dolls and doll clothing, doll mark cloth label America's Best Cottons, RBC. Columbian Doll Company 1891-1910 USA, are named after the 1893 Columbian Exposition, the Chicago World's Fair where the dolls were exhibited, the cloth dolls were made by sisters Emma & Marietta Adams; dressed cloth dolls, stitched fingers and toes, stitched shoulder, hip and knee joints, flat hand painted facial features and hair, painted by Emma until her passing in 1900, after 1900 artists were hired for the task. Marietta outfitted the dolls in simple cotton dresses, bonnets or caps hand sewn kid slippers or booties. Early doll mark Columbian Doll Emma E. Adams Oswego Centre, N.Y., later doll mark The Columbian Doll Manufactured by Marietta Adams Ruttan Oswego N.Y. 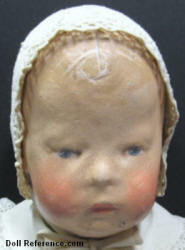 Comfort cloth doll mark, 1920s USA, thought to be a doll mark of doll artist Jessie McCutcheon Raleigh. Darrow Manufacturing Company 1866-1877 Bristol, CT USA, made 15 or 18" tall dolls with leather rawhide heads that were pressed, shaped and painted on a cloth body with leather arms and shoes, patented by Franklin Elijah Darrow and Deon E. Peck, dolls are marked with a green and gold paper label; F.E. Darrow PATENT May 1st 1866. Louis Eisen Company 1927-1929 USA, imported cloth pressed mask face dolls Art dolls, probably from France; Clown dolls, Peasant dolls, Artist dolls, Children dolls, dolls names; Apache doll (a French ruffian doll), Argentine doll, Aviator dolls, Aviatrix doll, it is unknown if/how dolls are marked. J. K. Farnell & Company 1871-1968 ENG, also known as Farnell's Alpha Toys, made pressed felt, velvet, stockinette cloth dolls, with side glancing eyes and smiling mouths, chubby bodies of stockinette with seams in front, back and sides of each leg, mohairor human hair sewn on in a circular pattern. Farnell made child dolls, native dolls, novelty dolls, coronation portrait dolls of King Edward VIII, King George VI,, dolls are marked with a tag; Farnell, Alpha Toys, Made in England or H. M. The King, Made in England, J. K. Farnell & Co, Action London or the portrait character's name. George H. Hawkins Company 1867-1870 NYC, USA, made cloth head dolls saturated with glue or sizing, pressed into dies and hardened retaining its shape. Doll heads marked on shoulder X.L.C.R DOLL HEAD Pat. 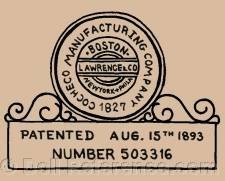 Sept. 8, 1868 (issued in USA, France, England) which is sometimes found on Automata Mechanical dolls made by William Farr Goodwin. Klumpe, Layna, Nistis or Roldan Companies 1950s+ Spain - all of these companies made a cloth covered wire armature doll with a painted mask face that represent; Spanish dancers, professionals, a person doing a hobby or activity, historic characters, dolls are usually under 12" tall, are charmingly dressed and posed as about 200 different characters; a Flamenco dancer male or female, doing an activity; Fishing, holding a Birthday Cake, Lady Shopping in windy weather, Mother and Child, Skiing, Swimming, etc, as a Professional; Bull fighter, Doctor, Nurse etc. Dolls would have had a tag attached to the clothing identifying it's maker. Effanbee imported Klumpe dolls to the USA, Rosenfeld Imports & Leora Dolores of Hollywood imported some Roldan dolls. Knickerbocker Specialty Company 1904 USA, made a cutout cloth rag doll that looked like a Buster Brown doll. Richard G. Krueger Company 1917-1964+ USA, best known for their 1920s-1930s cloth dolls, mask face dolls, rag dolls and stuffed plush animals, also made bent limb baby dolls, rattle head dolls. Maintained a relationship with King Innovations, who was the sole licensed manufacturer by Rose O'Neill of cloth stuffed 1929-1930+ Cuddle Kewpies or Cuddly Kewpies dolls, sizes 11, 14 1/2, 17 & 22" tall, Krueger registered patent 1785800. Many of their cloth dolls are similar to Averill, Mollyes and Knickerbocker dolls. Body and clothing is usually well marked with a cloth tag: R G Krueger NYC or as shown below. Krueger filed a trademark patent as late as 1964 and is the last date we could find for this company. They also sold plastic or vinyl baby dolls ca. 1960s. Labrador Cloth Tea Dolls 1960s+ North America, dolls made of caribou skins stuffed with tea and dressed, made by Intuit and Eskimos in the arctic regions of North America. Live Long Toys Company 1923-1940s Chicago, IL USA, made oilcloth, mostly comic cartoon character dolls designed by Eileen Benoliel; Skeezix, Little Orphan Annie and her dog Sandy, Herby, Red Grange, Kayo, Emily Marie, Smitty, Moon Mullins, Corky - Skeezix's baby brother, Jane, Humpty Boy, Clown, Baby Bibs, Pat, Jean, Harold Teen, Perry Winkle, Freckles, Snappy Dolls, Sunday comic characters designed by William Donahey; Teenie Weenie dolls made of oilcloth, actress Esther Starring in "Mama's Angel Child" oilcloth doll designed by Penny Ross and Chester Gump designed by Sidney Smith,. Moravian Dolls 1872+ Bethlehem, PA USA, the Ladies Sewing Society of the Central Moravian Church created the Polly Heckewelder 15" tall doll in 1872, in honor of Johanna Marie Heckewelder (known as Polly) daughter of missionary John Heckewelder from Salem, Ohio. Also Benigna a 6" tall doll (named after the founder of the first Protestant boarding school for girls in America) made by the Bethel Circle of King's Daughters of the first Moravian Church of Bethlehem, PA and Anna Nitschmann dolls. Dolls are all unmarked. 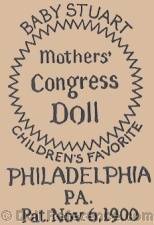 Mothers Congress Doll Company 1900-1911, Philadelphia, PA USA - made cloth rag dolls from a seven piece pattern to be put together, dolls designed by Madge Lansing Mead, doll mark found on some dolls; Baby Stewart doll, Children's Favorite, Mothers' Congress Doll, Philadelphia, Pa. Pat. Nov. 6, 1900. Nelke Corporation 1917-1930, Philadelphia, PA USA, made dolls from single piece of knitted stockinette fabric from the Elk Knitting Mills Company (owned by Harry Nelke), the cloth dolls have bright waterproof painted faces, stuffed with floatable Java fabric without using pins or buttons, doll marked with a ribbon label in a diamond shape Nelke. 1918 Nelke Dollies doll, 1920-1929 Gold Dust Twins dolls; Dusty and Goldie 5 1/2" tall, cloth advertising dolls for Gold Dust washing powder soap, 1921 Nelke Boy doll, Nelke Clown doll, 1923 Nelke Cop doll and the Imp doll, 1923 Diggeldy Dan doll, a cherub like rag doll, 1924-1930 Indian dolls, Sailor dolls sizes 12, 14, 18" tall, some cloth dolls are shown in the 1928 Sears catalog, page 157, Nelke dolls were also distributed by Davis & Voetsch. 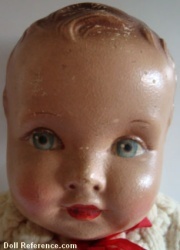 Philadelphia Baby doll or Sheppard Baby doll ca. 1900s USA, sold through the J. B. Sheppard Linen Store on Chestnut Street in Philadelphia. A life size cloth doll, 18-22" tall, all cloth oil painted stockinette head and body, jointed at the shoulder, hips and knees, painted hair, molded face, painted eyebrows, deep set eyes with pronounced eyelids, closed mouth with indentation in lower center lip, applied ears, mitten style hands with separate thumbs, dolls are unmarked. M. Pintel & Fils Company 1913-1928 FRA - made cloth dolls; girls, boys, clown, some may have a mask face, doll mold 131, was a member of Chambre Syndicale, doll mark a ribbon bar with in red, white & blue. Prager and Rueben Company 1942+, 510 East 73rd Street, New York, NYC, USA, made small US Paratrooper parachute, brown cloth dolls named; Raggy-Doodle 6 3/4" tall with a mask face, attached clothing and attached parachute that folds back into a pouch on it's back, WW II (1939-1945) era toy. Parachute is marked with red ink stamp; Raggy-Doodle, U.S., Parachute Trooper, Design Patent Allowed. Patent No. 133160 or 133180 by M. Hoyle. 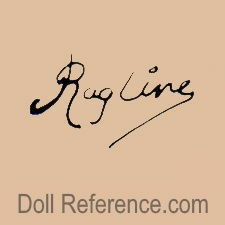 Ragline cloth doll with molded features; date, maker and country unknown, doll marked in script Ragline. Shanklin Toy Industry 1915-1920 ENG - then became Nottingham Toy Industry - British Toys, made cloth dolls with composition heads or mask faces, cloth bodies usually of stockinet and baby dolls in both black or white. 1917 Baby Bunting doll, Bambino doll, Betty and Kate Greenaway children dolls, cloth Paddler dolls that can sit or stand wearing black and white swimsuits and hats. 1918 British Babes dolls, Bye-Bye Baby dolls, Christopher dolls, Jane dolls, Jim doll, Patty doll, Prudence doll, Shirley and Suzanne dolls. 1919 Baby Ann doll, Miss Peggy doll and a Bather doll. 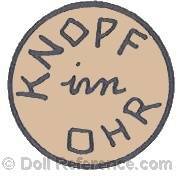 Margaret Steiff Company 1880+ GER, best known for their Teddy bears and other plush animals Steiff also made dolls in felt, velvet or plush, dolls marked with a ear button (as shown) KNOPF inn OHR after 1904. In 1988 a line of vinyl headed Steiff dolls on cloth bodies was introduced. Miss Tebbets & Marion Curry Tebbets (probably sisters) 1921-1930s+ Pittsburgh, PA, one piece needle stitched cloth stockinette dolls, about 6 1/2" tall, similar to Nelke cloth dolls, dolls marked with a cloth label sewn into a seam, trade mark Petiekin, 1924 Honey doll, mark as shown below, Pat. May 13, 1924. W.P.A. 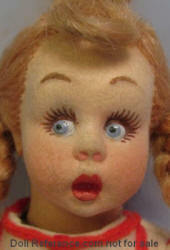 Dolls 1930s USA, Works Progress Administration provided work for artists and seamstress during the Depression years, cloth dolls painted facial features, yarn hair, about 12" tall, usually marked; Michigan W.P.A. Toy Project, W.P.A. Museum Project Wichita, Museum Project 1865 W.P.A., W.P.A. Handicraft Project Milwaukee, Wisconsin, W.P.A. Macon, Georgia or similar. Izannah F. Walker Doll Company 1865+ Central Falls, Rhode Island USA, primitive stockinette stuffed cloth rag dolls with oil painted or sculptured faces, doll mark Patented Nov. 4th, 1873 or I.F. 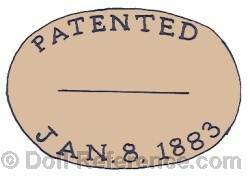 Walker's Patent Nov. 4th, 1873 or unmarked. It is believed Miss Walker may have produced her cloth dolls as early as 1840.